Have a little fat with those greens. I recently learned that if you eat some healthy fat with your greens it helps your body absorb the nutrients from the greens. On a whole foods – plant strong food plan we go oil free. Why? Although oils like olive, sunflower or corn do come from plants they are not whole foods. The oil has been extracted leaving out the healthy fiber, nutrients and minerals. What you are left with is the most concentrated source of empty calories at 120 calories of fat per tablespoon. Oil is dense in calories but not in nutrients. When you consume fats from whole foods like nuts, seeds or avocados you are also getting vitamins, minerals and fiber. The salad dressing/dip shown above is made with raw cashews that provide healthy fats. This Dijon Date Dressing/Dip is our favorite salad dressing – in fact I am obsessed with it. There are other dressings I want to make but when it comes to salad time this is the one I always make. It’s to live for! It contains healthy fats from raw cashews and gets a little sweetness from all natural but very sweet dates. We don’t like our dressing to be too sweet so I only use 1 date so the flavor of balsamic vinegar and Dijon mustard shines! M-m-m-m good! I make a batch every few days. As it sits in the frig it gets thicker so by the second day I sometimes add a little more Balsamic vinegar to thin it out or it can be used as a dip for raw veggies. To get a silky smooth consistency I process this dressing in my BlendTec high powered blender – twice. 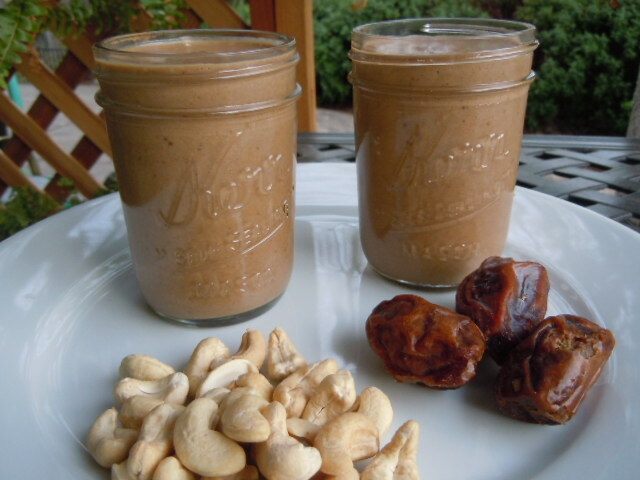 If you don’t have a high powered blender you can still achieve a smooth blend if you pre-soak the cashews overnight in water, drain off the water and proceed or you can use cashew butter instead of whole nuts. Here is the same dressing/dip made with white balsamic vinegar – it won’t make your salad look so dingy and might be more appealing to some folks. I don’t think the white balsamic vinegar is as bold flavor wise as regular balsamic but it still makes a tasty dressing. If you don’t want to make your own nut based salad dressing you could opt for a fat free dressing (choose one that is not full of sugar, salt and preservatives) and toss an ounce of raw nuts or seeds into your salad for a dose of healthy fat. Of course a little fresh avocado is also a good option for healthy fats with a salad. Just watch portion control with nuts and seeds about an ounce a day is plenty good. Blend all ingredients together in a high powered blender or food processor until silky smooth. Store in refrigerator. 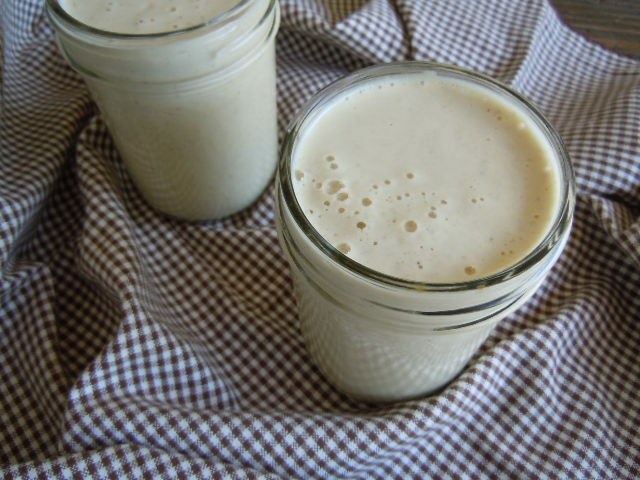 *If you soak cashews covered with water overnight it will soften them so they will blend easier. Pour off water before blending. Recipe adapted from Eat To Live by Joel Fuhrman, M.D. *The nutritional information and WW PP values posted on Nutmeg Notebook are my best estimates based on the brands of products I use and the software programs used to calculate them. If you rely heavily on the nutritional information and WWPP values I encourage you to double check the values given, using the brands of products you use. If you find big differences feel free to email me or leave me a comment letting me know. Looks and sounds delicious Tami, must try it! The recipe does sound delicious but I respectfully disagree with your comment “… if you eat some healthy fat with your greens it helps your body absorb the nutrients from the greens.” I don’t believe (like Dr Esselstyn) that there is such a thing as healthy fat and I doubt that eating fat (even plant-sourced) with greens increases the absorption of nutrients. Also in relation to your comment “When you consume fats from whole foods like nuts, seeds or avocados you are also getting vitamins, minerals and fiber” you are also consuming fat. May I suggest you search for the latest Chef AJ video which shows the huge impact of nuts, seeds and avocadoes on her weight loss? And go to YouTube and search Dr Esselstyn’s “No oil” video. As Dr John McDougall says, “The fat you eat is the fat you wear.” That occasional handful of nuts (and who stops at one handful?) and avocado could just be the thing that’s preventing weight loss – and it’s also contributing to your overall fat load and potential heart disease. You can get the “vitamins, minerals and fiber” from far healthier sources. We will have to agree to disagree on this one Diane. I subscribe to Dr Fuhrman’s dietary guidelines. Perhaps you should read one of his books and read about the science of why he recommends people eat a small amount of all natural healthy fats from nuts or seeds – not more than one ounce a day. I don’t eat a handful of nuts – ever! I use a small amount in salad dressings that are then spread out into 8 servings in order to keep me at my limit of 1 ounce of nuts or seeds per day. Dr Fuhrman’s foot notes include the studies that support his view points. Chef AJ has a food addiction to nuts and chocolate and she could not eat a small amount of them – that is one of the reasons she gave them up. We have chatted on the Fuhrman message boards about why she gave up nuts.She does now eat seeds such as sesame and flax in order to have some fat in her diet and get the other health benefits that these foods provide. Dr Esselstyn’s own son Rip has the Engine 2 plant based food plan that also includes the use of nuts, seeds and avocados. If you have heart disease that is a different matter and you might need to subscribe to a more rigid plant based diet.We all have to make our own choices based on our family health history and work with our doctor to find the right path for us. I have done my homework and feel confident in how I eat and what I share on my blog. Looks great! So the bottom pic was done with the white balsamic? Yes it was which makes it nice for slaws and dishes we don’t want to have dark dressings on.